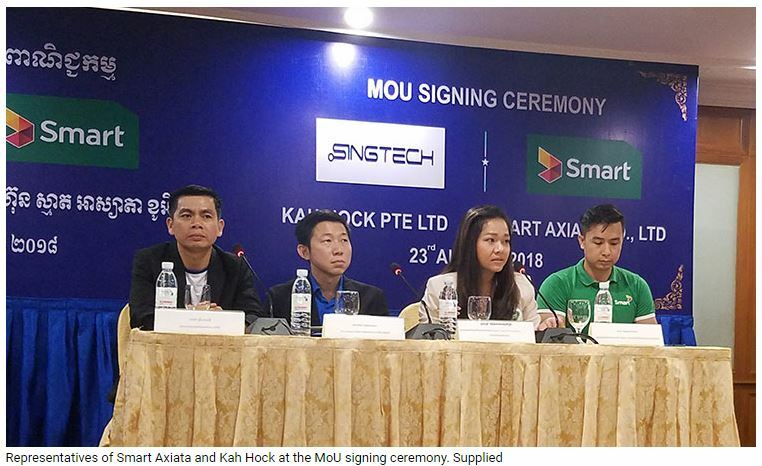 Kah Hock and Smart Axiata yesterday signed a memorandum of understanding at the Sunway Hotel, establishing a partnership to promote the Singtech brand of mobile phones and bring a number of special offers to customers of both firms. Kah Hock is a Singaporean mobile phone manufacturer and the owner of the Singtech brand, while Smart Axiata is one of the country’s leading mobile operators. Try Leangkry, general manager of Kah Hock, said the partnership will allow customers to enjoy Smart’s cutting-edge 4.5G technology in Singtech handheld devices. “Customers can now find Singtech phones in all Smart shops across the country. They will enjoy free access to the internet for up to 12 weeks,” Mr Leangkry said. He said the Singtech brand continues to gain ground in the Kingdom. “This new partnership with Smart will bring allow our customers to enjoy the latest smart phone technology available,” Mr Leankry said. Sim Chansopak, head of consumer proposition and devices at Smart Axiata, said the agreement will benefit customers of both firms. “With the launch of this partnership, Smart subscribers will be able to purchase affordable and reliable smartphones to enjoy Smart’s 4.5G,” she said.